Here’s my concept design for a new UK passport. 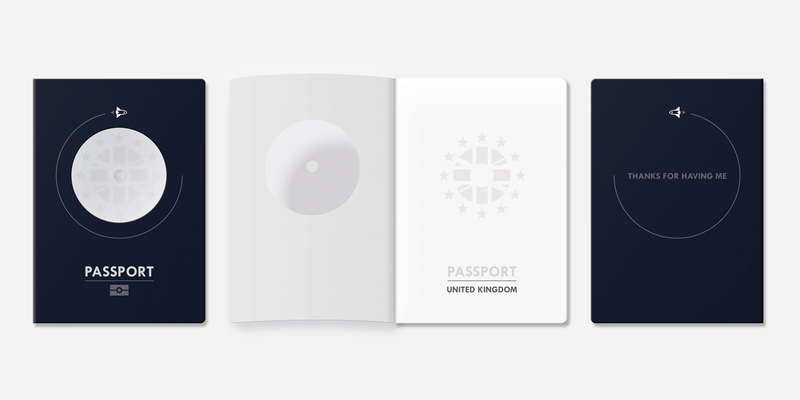 The silver-foil dot in the centre of the front cover is deliberately the most striking visual element, placing emphasis on the most important thing a passport represents; The travelling individual. The deep blue cover represents outer-space* and the white of the inner page, revealed through the clear plastic window embedded into the cover, the Earth. This is deliberately the second most visually striking feature, connecting the individual with the entire world community. The spaceship hints at future travel trends, and helps define the window as the Earth. The ship loops around the Earth in a clockwise direction on the front cover (outward journey), and anti-clockwise (the return) on the back. Two levels are shown between the individual and the Earth, printed on the first inner page in a less-important grey. First the Union Jack, then the twelve stars of the European Flag (1955) that stand for “ideals of unity, solidarity and harmony among the peoples of Europe”. The EU adopted the European Flag it as their “emblem” in 1985 and they call it “the EU flag”. “UNITED KINGDOM” is not included on the front cover, but features on the first inner page. “Thanks for having me” is written on the back cover, reminding travellers throughout their time in other countries to maintain the same level of kindness and politeness they would expect from guests in their own home. * I tried black, but it looked like a passport “The Baddies” might carry.